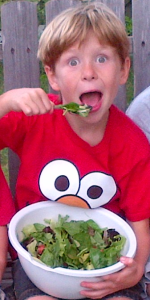 Raising Healthy Children–Is Raw Vegan the Answer? Children are one of the greatest resources in society. When we look at them we see hope for the future. Possibility. Joy. Energy. Enthusiasm. That’s why it rips out our hearts when we see them get sick. Every parent wants the absolute best for their child and particularly that they be healthy. Parents are not taught what to feed their children in order to achieve that goal. In fact, some parents have been led to believe that putting soda pop in a bottle or even cow’s milk is okay. Both have caused major health problems from ear infections, cavities, bowel disturbances, colds, allergies, mood upsets, hyperactivity and more. The greater tragedy are diseases like Autism and cancer. Many parents have had success with both of these conditions by removing dairy, sugar and gluten. Many children instinctively push away meat but are forced to eat it by well-meaning parents who have been told by pediatricians to give it to their children for protein for proper growth. And while we know all humans, including children, should eat more fruits and vegetables in order to be healthy, parents are often at a loss on how to do this given all the advertising aimed at children for sugary cereals and junk food fed at schools. And surely one wouldn’t feed their child NOTHING but fruits and vegetables, right? I mean, they couldn’t survive on that, and even if they could, they wouldn’t want to because only mean parents would deprive their children of sweets, French fries or burgers. And yet again, once in awhile we meet someone that causes us to question all of our prevailing beliefs and what we previously thought was possible. We meet a family that raises the bar and leads the way out of the dark hole to a bright light on the other side. Meet Levi. This young fellow has been raw vegan since birth. He is happy and he is healthy. His parents love him and are healthy, too. 1) Levi, how long have you eaten a 100% raw vegan diet? I have eaten a 100% raw vegan diet since birth. I am 9 years old now. 2) Do you ever get sick? If so, do you ever take medicine for it or go to the doctor? Once or twice a year after staying up late a lot (like at Christmas) I get the sniffles for a few days. That’s it. I don’t take medicine and I only go to the doctor once a year for a check-up. 3) Do you ever get cavities? How are your teeth? I got one small cavity when I was younger because I didn’t brush my teeth very well. My teeth are good now. I brush twice every day (once before I go to school and once before bed). I also floss my teeth before bed. 4) Are you in the normal ranges for your age group for height and weight? I am in the low end of the normal range for height and my weight is right for my height. My dad was always the shortest kid in the class until he was 14 years old so I likely take after him. 5) What do you eat in a typical day? What are your favorite foods? On a typical day I eat melon for breakfast (cantaloupe, watermelon or honeydew) and pack my lunch with 3 bananas and whatever other fruit we have that is ripe, like grapes, peaches, mango, cherries, blueberries or oranges. Sometimes I also take cucumber slices or coleslaw (shredded cabbage with carrots and my dressing is lemon with a bit of olive oil and RealSalt). When I come home from school I sometimes have a snack of fruit or coleslaw. For dinner I eat a giant salad made of cucumber, radish, red/orange/yellow pepper, green onion and tomato with lots of baby spinach, spring mix and romaine lettuce. My dressing for the salad is also lemon and a bit of olive oil (first cold-pressed extra virgin). If I play sports that day, like hockey or soccer, I drink the water and eat the coconut meat of a young Thai coconut. Sometimes when I run with my parents we have banana milk after we are done (6 bananas blended with 2+ cups of water and sometimes a bit of cinnamon). My favorite foods are peas, melon and my big salad. I eat a low fat raw diet that is mostly ripe fruits and veggies. I don’t eat many nuts and seeds or avocado or dehydrated food. Sometimes my mom and dad make special dehydrated snacks for me (like onion crackers). 6) Do you ever eat any cooked food? Do you ever miss eating the junk food like candy bars and cakes that your friends eat? I have never eaten cooked food in my life. I don’t even know what that food tastes like. I don’t want to eat junk food because I know that it’s not healthy and I don’t want to get sick like other kids do. I also have a lot of energy and endurance when I play sports. I love eating fruit and I love veggies and my big salad. 7) What do you do when you sleep over at someone else’s house? If I sleep over at someone else’s house I bring my salad and some fruit and sometimes some veggies. I also bring a big melon for the morning. If I stay at my friend Fozzie’s house his parents have fruit and veggies for me. What do your friends eat when they come over to your house? When my friends come over to my house, I try to give them the things they really like (usually vegetarian). Sometimes they have some of my food as well. Most of my friends like fruit too! Do the other kids give you a hard time at school for eating the way you do? Other kids haven’t given me a hard time at school since I was in junior kindergarten. I used to bring my blended green food to school when I was 5 years old and the older lunch monitors would make fun of me. But now nobody does. Sometimes my friends bring me a special fruit treat when we have a special event at school and everyone is eating food I don’t eat. They are good friends! 8) Tell us a little about your videos and website. What can people expect to find there? My website is www.RawFoodLevi.com and I have videos and recipes there. 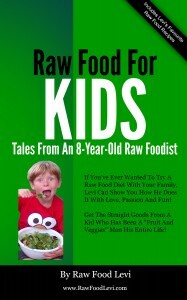 People can also buy the book I wrote, called “Raw Food For Kids: Tales from an 8-Year-Old Raw Foodist”. People really seem to like my book and their kids like it too. A lot of people get it for their grandkids and nieces and nephews also. If you put in your email address on my website, I can send you cool new videos, recipes and other information. I also put stuff on facebook.com/RawFoodLevi I try to make my website fun! 9) Do you ever go to the doctor’s to get blood tests to make sure you are getting everything you need nutritionally? If so, how are the results? Once a year I go to the doctor so that they can test my blood and check the results. The results are fine. I take a B-12 pill once a month to make sure I get enough. The doctor would like my iron level higher but it is ok. My dad says my iron won’t be as high as other people because I don’t eat meat. 10) Is there anything else you’d like to add that we haven’t covered here? 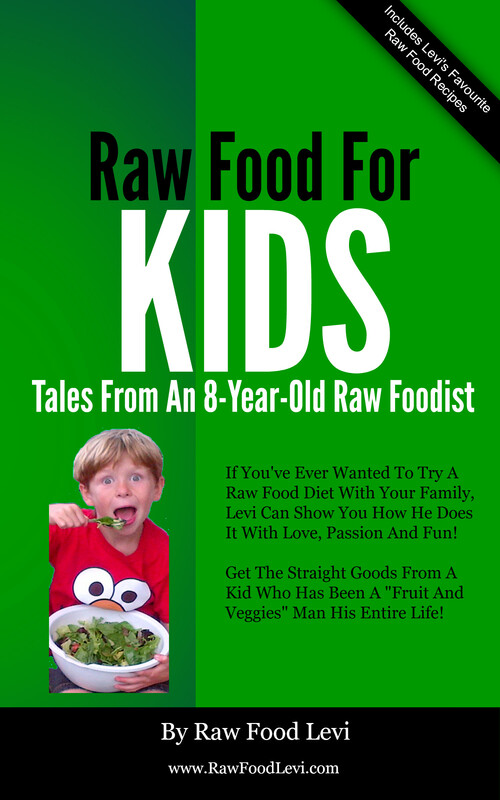 I made my website and wrote my book because I wanted to show parents and their kids how to eat raw food. I never get sick and I have tons of energy and I hope other kids can learn to be raw too! As you can see, this young man is thriving. And I would like to add, if this diet was deficient in any way, it would have shown up by now. Levi met Cappi Osborne, Anne Osborne’s son this last year who also has been raw vegan since birth and is also thriving. Jinjee and Storm Talifero raised their five children raw from birth and some are teenagers now and some are young and are all thriving. And, the food is delicious to them. Kids love fruit and green smoothies. And Levi loves his salad. Why? Because that’s what he was raised on and his taste buds were not perverted with excitotoxins like MSG and sugar. He makes fruit smoothies and coleslaw. There will be a transition phase to be sure, but you don’t have to worry about “depriving” your child of anything unless you feel depriving them of being sick or obese is something they might hold against you later in life. Spare yourself as a parent in having to deal with the mood swings and adolescent insecurities from acne and weight gain by raising a healthy teenager. You are giving them the best foundation in life.